*The bigger the Winter Olympics have become -- and that growth has been exponential over the past 30 years, in TV hours, general media exposure and number of countries involved -- the smaller the Olympic-year worlds have become by comparison. *The figure skating competitive season already is too long, and the top athletes have planned to peak at the Olympics. Starting with Challenger Series events in September, which now are taken seriously, the physical, mental and emotional demands on skaters in this big-trick era are rigorous. Injury and (at least temporary) burnout can follow. *More and more Olympic medalists are taking a pass. Before the end of compulsory figures in 1990, world championship results in the Olympic year nearly always mimicked Olympic results, making another medal a done deal. Since then -- and even more so after IJS was first used at worlds in 2005 -- there has been a healthier unpredictability about results, which means an Olympic medalist risks having a newly glittering reputation damaged. *The numbers say it all: before 1992, just 16 of 148 Winter Olympic medalists (10.8 percent) and just four of 49 gold medalists (8.2 percent) did not compete at the ensuing worlds. Since then, 49 of 97 medalists (50.5 percent) and 21 of 37 champions (56.7 percent, including both pairs gold medalists in 2002), have not competed. Seven of 12 medalists and two of four gold medalists are out this year. *Even the top U.S. women's alternate and top two men's alternates turned down the chance to skate at this year's worlds when withdrawals opened a spot. It's a good bet Italy's Carolina Kostner would have pulled out if this week's worlds were not in Milan. *The results must be asterisked. Post-Olympic fields are so watered down even U.S. pairs can win medals, as happened in 1998 and 2002 -- the only U.S. pairs medals at worlds in the past 20 years. What about the issue of worlds results determining national entry allocations for the following year? A simple change solves that. Use the results from the Olympics and pre-Olympic year worlds. A country whose results in either meet the criteria for two or three entries would get that number in the post-Olympic year worlds. Yes, in a few cases that may give the leading countries more entries in a discipline, but what's wrong with having more good skaters at worlds? *If ISU member nations are willing to bid for, and organize, world championships after the Olympics, why not have them? This season, if you are disappointed Yuzuru Hanyu, Wenjing Sui and Cong Han, Evgenia Medvedeva or someone else isn't there, then don't watch. Don't buy a ticket. Judging by the replica of the Duomo that the organizers in Milan have installed in the 2018 World Figure Skating Championships kiss-and-cry, they're excited to hold the event. *I don't buy the "best skaters aren't there, so the title gets an asterisk" argument. Athletes retire, sustain injuries, suffer fatigue and take time off, and it's all part of sports. 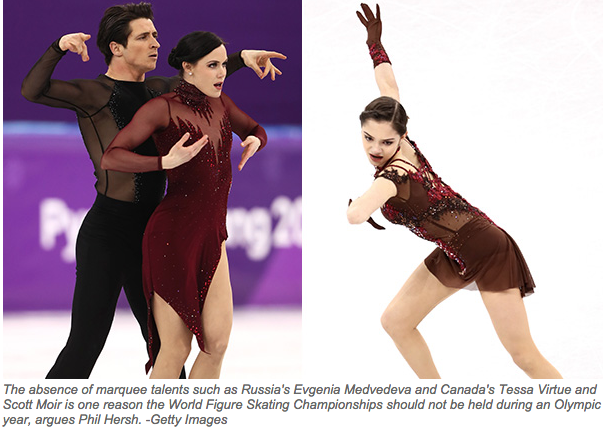 Tessa Virtue and Scott Moir of Canada will in all likelihood never compete again; if France's Gabriella Papadakis and Guillaume Cizeron win a third world title in Milan, it doesn't mean less on their resume. All any athlete can do is compete against the athletes who have shown up to that particular event. If Rafael Nadal decides to skip the French Open this year, they are not going to cancel the event. *While other winter sports don't hold world championships in Olympic years, many of them are considerably lower profile than figure skating, which still garners some of the highest ratings of the Olympics. Skipping world championships denies fans the chance to see more skating and lets it slip into the category of a niche sport. If skating can sustain annual world championships, it should. *A four-year cycle always ushers in new stars, or gives current ones a chance to shine after Olympic disappointment. In 1998, many Olympic medalists did not compete at worlds. Still, Alexei Yagudin won the first of his four world titles; Evgeni Plushenko won his first world medal; Michelle Kwan won a second world title; Elena Berezhnaya and Anton Sikharulidze won their first world title. In Milan this week, Nathan Chen -- winner of the free skate in PyeongChang -- could step up and win his first world title. So could Kaetlyn Osmond, Shoma Uno or Boyang Jin. World champions Carolina Kostner, and Anna Cappellini and Luca Lanotte get perhaps a final chance in front of a home country crowd. Skaters that didn't compete at the Olympics, including Wakaba Higuchi, and Kaitlin Hawayek and Jean-Luc Baker, go to their first worlds. Fields are deep enough, and there is enough parity among countries to create plenty of reasons to watch. *I've heard the argument figure skaters are expected to compete too often, but I don't buy it. A top U.S. skater may do one low-pressure summer competition prior to Champs Camp, then a Challenger Series event, followed by two Grand Prix events and, if they are in the top six, the Grand Prix Final. Then it's the U.S. Championships, perhaps the Four Continents Championships, and worlds. If it's an Olympic year, other skaters are often chosen for Four Continents. That is at most seven or eight, possibly six, competitions per year, not counting exhibition performances like the Japan Open. There are plenty of opportunities to manage top skaters' schedules that don't include cancelling worlds for all skaters.